We understand how important it is for marketing communication professionals to stay on top of the latest innovation and consumer engagement technologies. It’s critical, not only stay ahead of the competition, but stay relevant and aligned with your customers want to interact with you. But against the pace of business today, who has the time or resources to ‘really’ stay on top of what’s happening? To play with the latest tech and solutions, and understand how it might be applied to their own brand and business? Well, we can help! Our on-site Mobile Innovation Workshop solves exactly this problem. In just a few hours, we’ll empower you and your team with the hands on experience and knowledge of the latest mobile technologies and engagement solutions, whilst helping you create ideas for your own business or clients. Covering the latest technologies such as Augmented Reality, Virtual Reality, iBeacon and other positioning systems (M-Nav, Smartwatches, etc.). We’ll discuss their definition, their variations characteristics and capabilities, typical use cases with several case studies and typical examples. Duration: approx 60 minutes. This is when everybody can try and experience the technologies for themselves: put on VR head-mounts (Oculus Rift, Samsung gear VR, Zeiss VR One, etc) understand how a smartwatch is working with the paired phones, explore 3D augmented reality animation or navigate around the room with various IPS technologies. The lab makes sure that participants receive the most important insights in order see the possibilities of these innovative mobile solutions. You can’t beat personal experience. 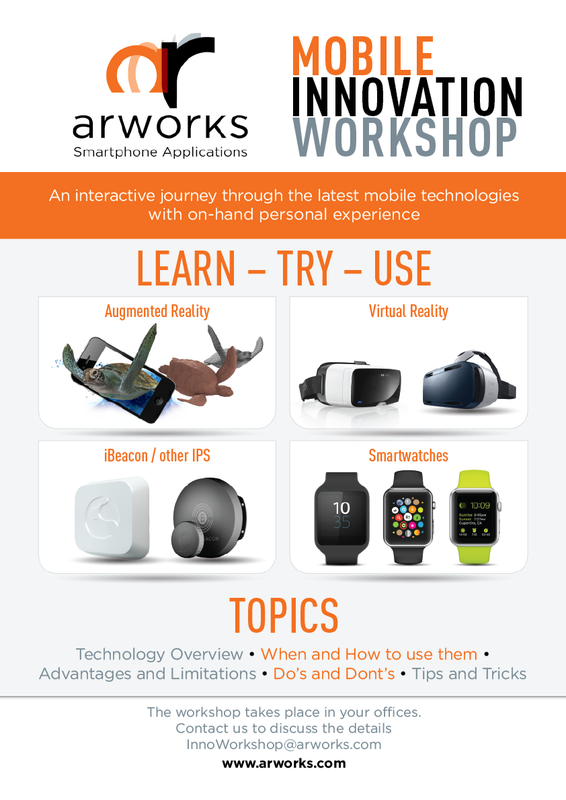 As a result of the workshop, participants will be able to identify areas where they can use these latest mobile technologies in their own work and in their proposals/offerings to their clients. It’s an incredibly valuable session for your entire team , so if you’re interested please get in touch with us ASAP so we can discuss the details.